Super Wizard HP Neck - The neck for shredders - 17mm thickness at 1st fret and 19mm at the 12th. 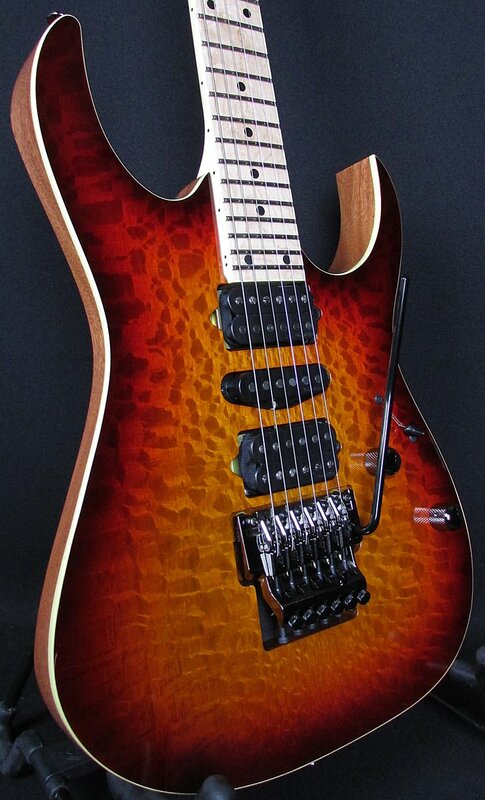 Silky Oak top/African Mahogany body - The RG657MSK features a Silky Oak top which has an exotic wood grain. Edge tremolo bridge - The masterpiece Edge bridge offers exceptional tuning stability, precise intonation adjustment, and playing comfort. DiMarzio® pickups - 6 strings - The DiMarzio® Air Norton™, True Velvet™ and Tone Zone® pickups offer depth, warmth and rich dynamics when combined with the 5-way pickup switch. Birdseye Maple fretboard - Birdseye Maple has a unique wood grain and features a well-balanced tonal character from low to high end.